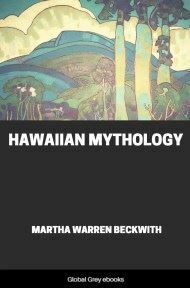 Starting in mythological times, and retelling some of the migration legends, Hawaiian Historical Legends is of interest for anyone studying encounters between cultures, particularly where one of the cultures has a technological advantage. 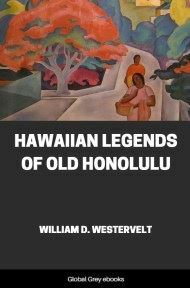 Of particular interest are Westervelt's speculations on early contacts, not only between the Hawaiians and the Europeans, but other Pacific rim cultures such as the Chinese, Japanese and Native Americans. 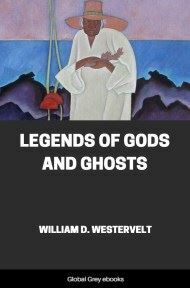 Chapters include, Paao From Samoa, A Viking Of The Pacific, Maui Seeking Immortality, The Red Mouth Gun, and, The Hawaiian Flag. 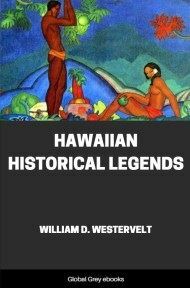 AMONG the really ancient ancestors of the Hawaiian chiefs, Maui is one of the most interesting. His name is found in different places in the high chief genealogy. He belonged to the mist land of time. He was one of the Polynesian demi-gods. He was possessed of supernatural power and made use of all manner of enchantments. In New Zealand antiquity he was said to have aided other gods in the creation of man. Nevertheless he was very human. He lived in thatched houses, had wives and children, and was scolded by the women for not properly supporting his family. Yet he continually worked for the good of men. His mischievous pranks would make him another Mercury living in any age be-fore the beginning of the Christian era. When Maui was born his mother, not caring for him, cut off a lock of her hair, tied it around him and cast him into the sea. In this way the name came to him, Maui-Tiki-Tiki, "Maui formed in the topknot." The waters bore him safely. Jellyfish en-wrapped him and mothered him. The god of the seas protected him. He was carried to the god's house and hung up in the roof that he might feel the warm air of the fire and be cherished into life. "Never mind; let him be our dear brother. In the days of peace remember the proverb, 'When you are on friendly terms, settle your disputes in a friendly way; when you are at war, you must redress your injuries by violence.' It is better for us, brothers, to be kind to other people. These are the ways by which men gain influence--by labouring for abundance of food to feed others, by collecting property to give to others, and by similar means by which you promote the good of others." Thus, according to the New Zealand story related by Sir George Grey, Maui was received in his home. Maui's home in Hawaii was for a long time enveloped in darkness. According to some legends the skies pressed so closely and so heavily upon the earth that when the plants began to grow all the leaves were necessarily flat. According to other legends the plants had to push up the clouds a little, and thus the leaves flattened out into larger surface, so that they could better drive the skies back. Thus the leaves became flat and have so remained through all the days of mankind. The plants lifted the sky inch by inch until men were able to crawl about between the heavens and the earth, thus passing from place to place and visiting one another. After a long time Maui came to a woman and said: "Give me a drink from your gourd calabash and I will push the heavens higher." The woman handed the gourd to him. When he had taken a deep draught he braced himself against the clouds and lifted them to the height of the trees. Again he hoisted the sky and carried it to the tops of the mountains; then, with great exertion, he thrust it up to the place it now occupies. Nevertheless, dark clouds many times hang low along the great mountains and descend in heavy rains, but they dare not stay, lest Maui, the strong, come and hurl them so far away that they cannot come back again. The Manahiki Islanders say that Maui desired to separate the sky from the earth. His father, Ru, was the supporter of the heavens. Maui persuaded him to assist in lifting the burden. They crowded it and bent it upward. They were able to stand with the sky resting on their shoulders. They heaved against the bending mass and it re-ceded rapidly. They quickly put the palms of their hands under it, then the tips of their fingers, and it retreated farther and farther. At last, drawing themselves out to gigantic proportions, they pushed the entire heavens up to the very lofty position which they have ever since occupied. 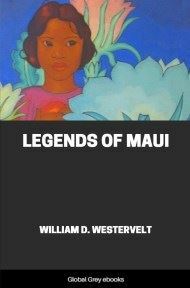 On the island Hawaii, in a cave under a water-fall, dwelt Hina-of-the-fire, the mother of Maui. From this home Maui crossed to the island Maui, climbed a great mountain, threw ropes made from fibres of plants around the sun's legs, pulled off many and then compelled the swift traveller of the heavens to go slowly on its way that men might have longer and better days. Maui's home, at the best, was only a sorry affair. Gods and demi-gods lived in caves and small grass houses. The thatch rapidly rotted and required continual renewal. In a very short time the heavy rains beat through the decaying roof. The home was without windows or doors, save as low openings in the ends or sides allowed entrance to those willing to crawl through. Here Maui lived on edible roots and fruits and raw fish, knowing little about cooked food, for the art of fire-making was not yet known. By and by Maui learned to make fire by rubbing sticks together. A family of mud hens, worshipped by some of the Hawaiians in later years, understood the art of fire-making.